The Autumn Equinox, known as Mabon in Celtic lands, celebrates the second harvest, sacred mysteries, balance and the season’s changes of colour. Mabon is celebrated on the 22nd of March in the southern hemisphere. As the days get shorter we are invited into the deep mysteries of the season, while nature puts on a spectacular show in amber, burgundy, purple, red and brown. There is still green on and beneath the trees and certain flowers still bloom in the more settled weather. Life slows just a little and people have time to appreciate the natural world and each other. Mabon is a harvest festival, especially for fruits and vegetables. This is the time for harvesting, processing and storing for winter. Make jam, shell nuts, pickle vegetables and freeze what is left over. 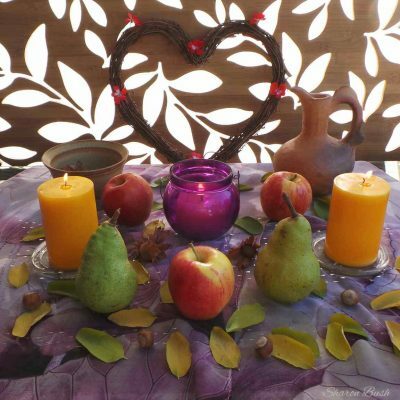 Gather what you need for a Mabon feast, for your immediate family or group. Share the cooking chores as you appreciate the things you are grateful for and the things you have accomplished. Setting up an altar or table centrepiece where the feast will be. Use the colours of the season, add apples, pears, vegetables, nuts, berries or whatever you have harvested or bought, and then add candles and leaves. This is the time to honour Mabon the son of Light, Modron the Mother Goddess (his mother), the Green Man of the forest and any wise older gods/goddesses. The seasons are sometimes presented as an age scale; spring-childhood, summer-young adult, autumn-middle age and winter-older years. This is also a good time of year to smudge the house with white sage or incense, this helps remove any stagnant energies. The ceremony is centred on balance, achievement and thankfulness. The light and dark are equally balanced during the equinox, so focus on the balance within and feel perfectly calm. Place things on the altar that represent your growth, creativity and study, this is your personal harvest! If you put effort in – claim your reward by acknowledging your achievements. Light your candles and say a few words about what makes you thankful. A quick meditation might be nice, think about the wonders of this planet and its inner mysteries. Thank Mother Earth and enjoy your feast!